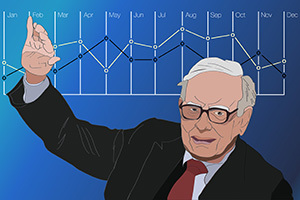 Berkshire Hathaway Inc. (NYSE: BRK.A) doesn't pay a dividend, but the company and the stock both benefit greatly from owning shares of some of the best dividend aristocrats on the market. CEO Warren Buffett has told investors about the power of compounding interest for decades and referenced it in a 1964 letter to his partners. At the time, he said an investment may start off paying just a few percentage points. For example, PepsiCo Inc. (NYSE: PEP) pays a dividend of $0.81 per share, which is a yield of 2.81%. If you bought $10,000 shares of PEP on May 1, 2016, and reinvested the dividends through a dividend reinvestment program (DRIP), your shares would have been worth $11,172 on May 1, 2017.
Dividend aristocrats are companies that have increased their dividend payments for 25 consecutive years. Exxon Mobil Corp. (NYSE: XOM) pays a dividend of $0.77, which is a yield of 3.75%. Aflac Inc. (NYSE: AFL) pays a dividend of $0.43, which is a yield of 2.32%. AT&T Inc. (NYSE: T) pays a dividend of $0.49, which is a yield of 5.12%. T-Rowe Price Group Inc. (Nasdaq: TROW) pays a dividend of $0.57, which is a yield of 3.27%. Clorox Co. (NYSE: CLX) pays a dividend of $0.84, which is a yield of 2.50%. If you just kept the dividends, your investment would be worth $11,147. That's a difference of only $25. So it may not seem like a big deal at first glance. However, Buffett said in that 1964 letter that the power of compounding interest "mushrooms" over time. According to its website, Pepsi first paid a dividend on Feb. 1, 2001. If you invested $10,000 and reinvested the dividends since then, your shares would have been worth $34,390 on Feb. 1, 2017, according to DividendChannel.com. That's an annual average return of 8.02%. In comparison, an index fund that tracked the S&P 500 would have made just $22,007, for an average annual return of just 5.05%. So you'd have an extra $12,383 in your pocket just from sitting by and having your dividends automatically reinvested for you. Best of all, this is a passive investment strategy that doesn't involve timing the market or making risky decisions. And because compounding interest is so powerful, I wanted to dig through Buffett's portfolio of dividend stocks, especially the dividend aristocrats. I wanted Money Morning readers to know exactly what's in Buffett's portfolio. Buffett currently has four dividend aristocrats in his portfolio, and one stands out above the rest. Dividend Aristocrat No. 4: The Coca-Cola Co. According to Fortune, Buffett drinks five 12-ounce cans of Coke a day. He likes the company so much that The Coca-Cola Co. (NYSE: KO) is Berkshire's 12th-largest holding. According to its website, Coke has paid a quarterly dividend since 1920 and has increased dividend payments in each of the last 55 years. Today, KO pays shareholders a dividend of $0.37, for a yield of 3.29%. The billionaire zeroed in on KO stock because of its strong business and because of the 1987 stock market crash. Coca-Cola is and was the most well-known soda maker, and Buffett believed the stock was being undervalued at the time. According to Investopedia.com, Buffett purchased more than $1 billion of Coca-Cola stock in 1988, which made him a 6.2% owner of the company. In the beginning of that year, KO shares opened at $2.39 on Jan. 4, 1998. On May 24, 2017, shares of KO opened at $44.51. That's an increase of 1,762% in 29 years. Now, Buffett has a 9.32% stake in the company, and his shares of KO are worth $2.2 billion. Dividend Aristocrat No. 3: Procter & Gamble Co.
Buffett owned roughly $4 billion in Procter & Gamble Co. (NYSE: PG) in May 2016, although his stake in the company was not through direct stock purchases. In 1989, Buffett invested $600 million in razor-blade giant Gillette, which gave Berkshire an 11% stake in the company. Like Coca-Cola, razor blades are a product consumers buy no matter what is happening with the company or the market. Sales will always be steady, and this fits Buffett's strategy of investing in what he understands. However, this was an even more profitable investment than Buffett could have originally imagined. Procter & Gamble announced in January 2005 that it would acquire Gillette, which valued Buffett's shares at roughly $5 billion. At the time, the PG stock price was trading at $54.50 per share. On May 24, 2017, the PG stock price opened at $86.45. In 12 years, that's a small increase of 58.62%. However, the dividend has drastically increased since Procter first paid shareholders $0.05 per share in 1990. Today, PG pays a dividend of $0.69, which is a yield of 3.19%. That's an increase of 1,280% over 27 years. He then exchanged most of his PG shares in 2014 when it was trading for roughly $90 per share for ownership of Procter's Duracell battery division. As of Q1 2017, Berkshire has $27.1 million worth of PG stock in its portfolio. Dividend Aristocrat No. 2: Wal-Mart Stores Inc.
Buffett first bought shares of Wal-Mart Stores Inc. (NYSE: WMT) in 2005. WMT shares traded at roughly $50 per share at the time. Today, Wal-Mart stock trades for $78.56 per share, which is a small increase of 57.12%. But the real wealth builder from WMT stock has been the annual increase in its dividend payout. If you purchased $10,000 worth of WMT stock in 1995, reinvested the dividend, and sold it 20 years later, your WMT shares would be worth $86,437. In comparison, an investment in a fund that tracks the S&P 500 would be worth $50,395, according to DividendChannel.com. Again, that's an extra $36,042 in your pocket with almost no upfront work at all. The WMT dividend payout has increased annually every year since it first paid $0.05 per share in March 1974. Today, the retailer pays $0.51 per share, which is a yield of 2.61%. That's a 920% increase over 43 years. According to Fortune, Buffett's shares of WMT were worth $3 billion in the summer of 2016, and Berkshire sold most of its shares in Q4 2016. The company unloaded almost $900 million worth of WMT and now holds just $109.5 million. The reason? Buffett saw the shift in how consumers buy products, using online platforms instead of shopping in stores. At Berkshire's annual meeting in 2016, he reportedly said Amazon.com Inc. (Nasdaq: AMZN) is a "big force" and that other companies have not figured out how to counter or effectively participate in online selling. Buffett's sell-off of WMT shows even if a company pays a dividend, the stock isn't always worth owning. However, we do have a new profit opportunity from one dividend aristocrat in Buffett's portfolio.